It seems that the old movie clichee is true… if you build it they will come! In all honesty the first OPEN WINDOW THINKING SESSION kind of happend when I started to invited people to come over and play and realised I did not have a table (or chairs) to offer them the most important element of my trade… THINKING SPACE. This reality kind of got me moving my home office stuff to the new Thinking Salon, opening up space and opportunity on both sides! Making space at home and creating a flexible thinking space at the Shop. What does happen when you have a space which has a residual reputation of being a bio-food/welness shop is that old customers drop by to see what is happening. Some even drop in and are convinced that you can still buy bio friendly Kenzo aftershave. The neighbourhood sees nothing in the window indicating what it is that I am doing, while they do actively check out what is happening in there… That is why I have now finally added a clue to what it is that I will be doing at the Johan de Witstraat 6A until I have figured out exactly what I will be offering in September. Rico Zweers, an old vizthink.nl host with IPMMC and now owner of de mannen van het schuim, came by to check out the Shop and discuss a project. When he entered the space he immediately said…:” Dennis… you are like an Artist in Residence!”. Usually I know what people are talking about when they share a thought about my situation, but in this instance I had no idea and was very interested to hear what this comparison meant. Rico drew the paralel with me and and artist who is invited to add life and style to an unused space in a public area. This can be in a city center or at a festival, where everybody involved benefits from working together. Sharing space and craft to organise creative moments that effect local vibe or even culture. This is it! Or at least for this moment in July! The only difference with the free artist scenario is that he whole point of my experiment with temporary spaces was to balance out art with design. This is why I added the designer and even the engineer. It is the essential counterweight to realise impact in a temporary space. 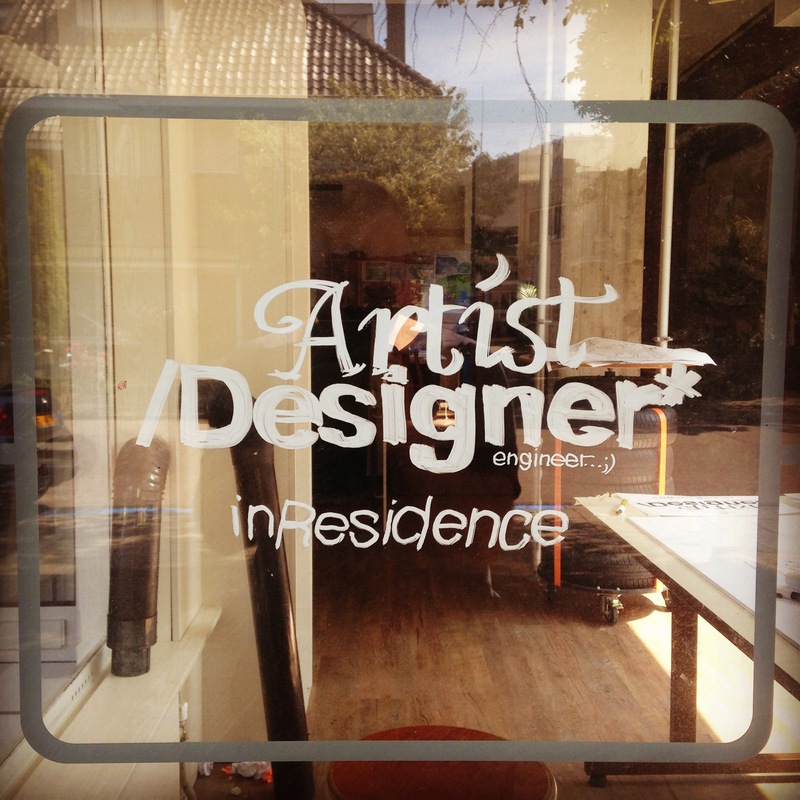 So… I am an artist/designer in residence. Welcoming you to drop by to share your story and see how we can help each other to go from thinking to some form of sharing (through drawing…;). More Window clues to come!